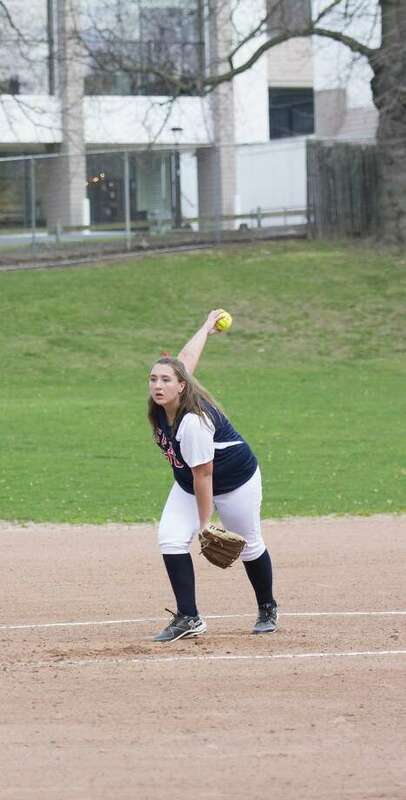 GFA senior Maddy Canning of New Canaan pitched her first varsity win on April 11 against The Harvey School, leading her team to a 23-13 victory. In what was a good week for Greens Farms Academy Dragons, the girls softball team won its first varsity game in three seasons, the boys baseball team won its first game of the year and the girls lacrosse team stayed undefeated. Maddy Canning (New Canaan) recorded her first varsity win from the circle as the Greens Farms Academy girls softball team won its first game in three years, 23-13 over The Harvey School on Tuesday. Lead-off hitter Lydia Groves (Riverside) had three hits and scored two runs while eighth grader Lucy Nelson (Westport) scored runs after reaching base four times in five at-bats. Senior captain Kallie Fellows (Fairfield) added three hits while junior captain Celeste Matte (Stratford) scored three runs on a hit and two walks. The game was clinched in the bottom of the sixth when Janise Park (Bridgeport) singled home Alyssia Getschow (Westport) from third base. Senior Kate Paliotta (Westport) had five goals and two assists to lead GFA to an 11-1 win over King on Monday. Alex Nesi (Fairfield) had two goals, Steph Wistriech (Wilton) had two goals, Sarah Peltier (Stamford) had 1 goal and 1 assist while Ella Murphy (Darien) had a goal. Fran DeVita (Darien), Lucy Holzinger (Norwalk), Caroline Rintoul (Darien) and Bella Litt (Darien) all had one assist. Kelly Van Hoesen (Greenwich) saved eight out of nine shots and Kaitlin Reed (Southport) stopped all three shots she faced. The next time out, GFA topped Hopkins by a 15-5 count. Paliotta scored four goals and assisted on another while a trio of other Dragons had three goals each as the team rolled to the win on Wednesday. Nesi, Murphy and Wistreich each netted three goals for the Dragons. Sarah Logan (Darien) and Katie Mackle (New Canaan) each tallied single goals while DeVita and Peltier both notched an assist. In net, Van Hoesen (five saves on eight shots) and Reed (six saves on eight shots) split the duties, backstopping the win. Playing without one of its top golfers due to illness, the Dragons hosted The Masters School at Birchwood Country Club and came away with a 9-0 victory earlier in the week. Eighth grader Will Lodge (Darien) led all scorers with a 41 to earn medalist honors. Senior Curtis Tauck (Westport) was one shot behind with a 42, and sophomore Giani Panariello (Westport) was one shot behind Tauck with a 43. Sophomore Piero Panariello (Westport) carded a 47 while senior captain Charlie Thompson (Southport) and eighth grader Will Mackle (New Canaan), in his first competition, turned in identical 51s. GFA, which won its first five dual matches of the season, then went to St. Luke’s on Thursday, falling to the Storm by a 6-3 count. GFA played well and held a 3-2 advantage until the final foursome. Piero Panariello led the way for GFA winning his match with a 38. Piero's 38 also halved for medalist honors. Lodge won his match with a 39 while Giani Panariello halved his match with a 41. Tauck shot a 44 followed by twin 51s from senior captain Thompson and Mackle. The GFA girls varsity tennis team defeated Westover School Monday in Middlebury by a score of 7-0, bringing their season record to two wins and two losses. Junior Devon Wolfe (Darien) won with a double-bagel at first singles; Sarah Wagner (Westport) won 6-0, 6-1 at No. 2 singles; Ryan Boyle (Southport) won 6-0, 6-1 at third singles; Kate Flicker (Fairfield) won 6-1, 6-0 at fourth singles. GFA’s top doubles team of Allie Agnew (Westport) and Stephanie Gentile (Westport) won 6-4, 7-6 (12-10); the No. 2 doubles team of Lauren Ritchey (Norwalk) and Jocelyn Magrone (Darien) won 7-6 (7-4), 6-2; and the third doubles squad of Margot Goldsmith (Darien) and Nikki Goldberg (Westport) won 6-4, 7-5. Later in the week, GFA trekked to Hopkins and fell by a 7-0 score.